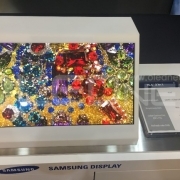 What is the Next Killer OLED Display Application? 現在位置: ホーム / フォーカス・オン / その他 / What is the Next Killer OLED Display Application? 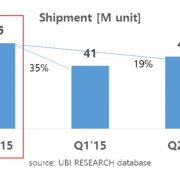 The interest in automotive display by OLED industry’s key leaders, Samsung Display and LG Display, is growing. 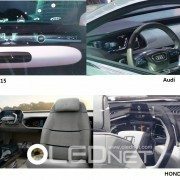 During the 1st OLED KOREA Conference (April 2, 2015), Dr. Ki-Yong Lee, vice president of Samsung Display, predicted that “in 2018, 1.4 display units will be applied per car and form a market of 150 million units” and emphasized that “flexible OLED panel has an advantage of fast response time and being unbreakable and therefore suitable for automotive display”. 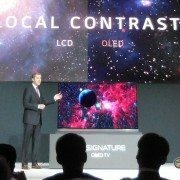 LG Display’s team leader, Won-Gyun Youn forecast that “from the rare keynote speeches from automobile manufacturers in this year’s CES, automotive display could be a new market for OLED”. Speaking at the 1st OLED KOREA Conference, Dr. Choong Hoon Yi, the president of UBI Research, also commented that “OLED’s merit of infinite contrast range will provide high visibility even in monochrome and appropriate for drivers, and flexible OLED can be freely applied to vehicle’s interior” and estimated OLED will be actively used for automotive display in future. OLED display, as flexible display, can be easily produced and cannot be broken. It also has advantages of infinite contrast range and fast response time and is a focus of automobile industry. Several cars have already been released with OLED display equipped instruments including dashboard and navigation. Recently, Italdesign Giugiaro’s concept car, Gea, equipped with LG Display’s plastic OLED was revealed in Geneva International Motor Show 2015. Following this trend, the company that is most proactive in OLED application in automobile industry is LG Display. LG Display has already announced their target of 30% world market share acquisition in automotive display with the revenue of approx. US$ 1,800 million in 2018. 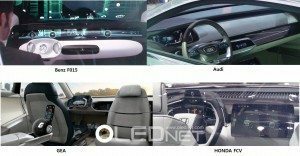 In CES 2015 held in January, LG Display also presented 13.1 inch automotive display and 21.5 inch curved plastic OLED that included instrument panel and CID. http://jpn.olednet.com/wp-content/uploads/2015/04/motor-show2.jpg 841 1620 OLEDNET http://jpn.olednet.com/wp-content/uploads/2015/09/logo_oled.png OLEDNET2015-04-06 14:04:152015-04-15 10:10:41What is the Next Killer OLED Display Application?